The sweeping illuminati media campaign of early 2009 was deliberate, precalculated, and it revealed blood curdling solid evidence that the daily firehouse of “news” “movies” and “popular opinion” that we are fed here in the USA is peppered with overtly “indoctrinational” propaganda items designed to encourage secular atheism. This is neither theory or conspiracy but is a hard cold fact of life in 21st century America. Now they are at again. There is a new movie out that makes the claim that Jesus never existed. This is patently false, and flies in the face of the New Testament of the twelve disciples who lived with him for three years, his own mother and siblings and literally hundreds of historical eye witnesses to his life and times. The archealogical evidence of His life continues to grow as new discoveries are made each year. The “great falling away” that Jesus discussed and prophesied to His disciples and followers 2,000 years ago continues unabated. Each time I see another heinous manifestation of the spirit of Antichrist at work in the American mainstream media, I will answer each new lie with a restatement of the truth, as my Christian faith demands that I do so. I encourage other Christians to do the same. It is a cosmic fact that Jesus lived, and His life left such an astounding mark on human history that the dating of all time since has been altered to record the world before Him as “B.C.” meaning Before Christ, and the world after Him as “A.D.” meaning After [his] Death. The constant outpouring of lies, more lies and even greater and more diabolical lies from the illuminati owned American mass media is sealing their own indictment in as the men and women who work in Big Media continue to try to use the media as a tool to erase all evidence of the life of Christ and the existence of God. Their efforts are frantic, puerile, pathetic, hollow and indicate an utter bankruptcy of real moral values, and a total lack of spiritual insight and sustaining inner Light. Jesus had a lot to say about these kinds of people in His time. He referred to them as “Ye generation of Vipers.” These modern day “vipers” are the men and women employed by Big Media in America and around the world who thrill to advertise any book, movie, video game, article or essay, or work of art which disparages Christianity and denigrates Americans as a people of faith in God. 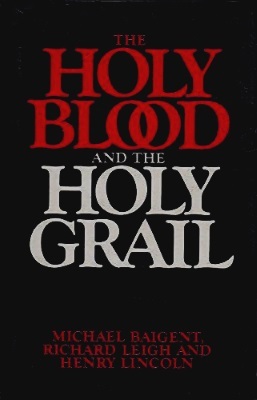 Using the media overtly in the past 20 years, since the publishing of “Holy Blood Holy Grail” to promote atheism at every opportunity represents the commencing of the “great falling away” that Jesus predicted would take place right before His return. The prophetic brilliance and accuracy of Jesus’s words continues to astound me. He literally saw these events taking place 2,000 years ahead of their occurence. Only a Divine Being incarnate could do such a thing. In the height of irony, it is their very Godlessness, made bold in big media advertising and secular atheistic headlines, movies, books, music, and pop culture that vindicates Jesus the Prophet. His imminent return will finally once and for all, vindicate Jesus the King of Kings. Not because I want to, but because I NEED to, on behalf of the young people of this nation, many of whom worship TV, Hollywood celebrities, and who believe that the filth which is now and again promoted by media outlets like NEWSWEEK actually means something, in the hope that I can open their eyes to what is actually taking place, as we enter the advent of the world apostasy, I will re-post below what I happened to find this evening, as a way of demonstrating what NOT to believe, and what to avoid when one reads the daily mashup of American media and pop culture. Open your eyes America. This illuminati owned media is determined to destroy your faith in God. Your silence will be complicity. Speak out. Fight back. Don’t stand idly by and allow a corrupted mainstream media which has become the right hand of the modern illuminati vipers teach your children these lies. Boycott Hollywood companies hat make movies like this and put them out of business. Also boycott this movie. [See link below] Close your purses and pocketbooks to this kind of media blasphemy against the Holy Spirit, and encourage everyone in your community who knows and loves God, and believes in HIS Son, to do the same. 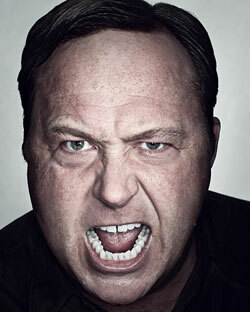 Shouting about mind-control assassins, the 9/11 conspiracy, and the Bilderberg Group, radio host Alex Jones has cornered the bi-partisan paranoia market. Given these views, it was a little odd to see the thickset Jones, dressed in black, squeezed in between Whoopi Goldberg and Barbara Walters on ABC’s The View in late February, talking about Charlie Sheen. Goldberg, in fact, looked a little stunned when Jones, a close friend of Sheen’s through the 9/11 “Truther” movement, which posits that 9/11 was an inside job orchestrated by Bush and others, began steering the conversation away from the celebrity train wreck and into the wilds of political conspiracy. At one point, Goldberg tried to lasso Jones—“You’re talking too fast for me, baby, slow down”—but Jones darted away. The women of The View, having lost control of their program, looked relieved to cut to a commercial. But Jones was only starting his grand tour through the mainstream media: That night, he appeared with Joy Behar to talk more about Sheen. Matt Drudge linked to a story on Jones’s website, Infowars.com, spiking traffic. There were also appearances on A&E and the History Channel. Large swathes of America now know that the fix is in. The current president is a foreign-born Muslim; the last one conspired to bring down the World Trade Center, then covered up his nefarious crime with a tale about some hijacked airliners. Why wouldn’t people believe something horrible is afoot, what with economic chaos and multiple wars and devastating earthquakes and tsunamis. In this era of information anxiety, it turns out that telling people they are right to be afraid, anchoring their fears in specific details, is an excellent business model—and in America now, the paranoia business is booming. Is it a problem that the top six media corporations dominate the information flow to most of the developed world? Multi-billion SDR (Have the globalists imploded it yet? Sorry, I’m getting ahead of myself). Multi-billion DOLLAR conglomerates, to use John Perkins‘ visualisation; “float around the globe like clouds”, with no loyalty to any particular nation, regardless if they have a head office in the very land mass in to which they pump warmongering patriotism and mainstream fear. Oh, and abdominal exerciser infomercials. One of the issues is commercially driven, mass media serves a profit-hungry loyal to sponsors; meaning advertisers and government, not the public interest. There are bigger trends to consider too. Can history provide us any teachings? Six company names; Bertelsmann, NBC (Comcast / GE), Disney, News Corporation, Time Warner, and CBS (/ Viacom) summarise the biggest controllers of media and information flowing through our eyes and ears today. It really is overwhelming to witness the power of a few men over all manner of worldwide media outlets, whether cinema, TV, DVD’s, print newspapers, magazines, cable TV, radio networks, or book publishing. Wherever you look, editors are paid by their seniors make sure that certain topics are given attention, and other topics are not given attention. Do you think that a media mogul is ever going to run a devastating hit-piece about himself, should the truth make his position untenable? Of course not. Is it so hard to imagine that just as the wealthy and connected chiefs of these Orwellian empires would never act to hurt their personal interests, just as similarly they would never act to hurt their commercial interests? How about the commercial interests of their friends? So-called journalists and reporters have mortgages to pay and mouths to feed, just like the rest of us. When confronted with heart-wrenching choices between intuition-approved honesty, versus the grinding war machine of profit and power, it is easy to understand the how and why corporate slaves roll over and capitulate to even questionable ambitions of their paymasters. Their paymasters too, are subject to the rules, policy, laws and pressured from their superiors and executives above them. With the influence of money, the few at the top dictate to an organisation marching in lock-step to serve the superior beneficiaries in the boardroom. When you read our letter, just keep in mind — we truly believe, that you do have weighty reasons to «disappear». We are not that type of fans, who watch for you at the streets. It was just a magic moment when your music once came into our lives and became the part of our world. This music, your music, was going in parallel with everything else which was happening in our lives. We just knew, that it existed and it would always be with us. Time passed by… Everyone of us was going his own way in life. Somebody was studying, somebody was building family, somebody worked hard, somebody was getting children and was bringing them up… Everything kept changing, good way or bad… And only your music was constantly with us. We lived our lives and had no doubt it was going to be this way FOREVER. There were times, when gossips, rumors and courts were trying to put your songs down, filling up the whole informational world and not leaving enough space for Your Music. Maybe, there were people who left their faith in you, maybe somebody forgot about you, but we only kept knitting our brows in pain each time we heard another «news». We did not want to hear that!!! We were hit in the face with questions: «What if it is true, these facts they write about him?». And we’d answer: «If it’s true, then why mass media are bringing this for discussion to the whole world?! Give Michael some respect! This person has done so much for our planet! Stop spreading your conjectures in the whole world!» And we kept listening your music, and getting joy from every new song. We were so gad, that even during that hard times you were still with us. They didn’t put you down, Michael!!! Mass media were trying to erase you from our hearts, but they will always beat in unison with yours, Michael. Your enemies know, where is the Lie, which they crated, but they are cowards and they’d never tell us the Truth. Only you know the Truth. You are the only key to Real Michael. And we truly believe that you won’t dump us. They are consciously destroying your image? Know! Mass media will never find support from us. And those, who believed — do you need them? Real natural selection had happened. The forces of evil got back what actually always was part of them. But we are always on your side, Michael! We do not want to intrude into your life. You simply can count on us. We value only that treasure, that you kept giving us all these years — Your Music. It was like when you wake up, open the blinds and realize that there is no birds no more, no clouds, no trees. All of the sudden, it all has disappeared and will NEVER come back. There will be pictures of clouds, records of birds signing, there will be memories about trees, but there will be nothing in reality and there will be no Future with them! And that’s what happened to us on June 25th, Michael. If there are your enemies in business, we would ignore their goods at the stores, we will through all their stuff into the dumpster. We will through all their magazines and newspapers in the garbage. They won’t get even a penny from us! We want to tell all the companies and all mass media, which were making big money on Michael Jackson — if you value Michael, just stand for the one, who brought this money to you and who keeps doing that! Companies, labels, funds, volunteers, mass media, take Michael’s side! You all owe your profits to him!!! Mass media, why are you diminishing what millions of people value all over the world, regardless of race, religion, age and gender? What for? What are you going to do if multi-million army of Michael’s defendants would stand for him??? Michael! Just know, your problems are our problems! Look, how many friends you got! There are millions all over the world! Just say one word, and we will come to help you! You can count on us, Michael! You have united us together. We want to make this world better together with you! We are giving you our hands, Michael. Just know, you have your family — it’s Us. We always will be on your side, whatever happens. Do not leave us, Michael… It’s impossible to stand that pain of loneliness and loss. Please, excuse us, that we did not defend you. You have given us so much, and we owe you… We really hope, that God would hear all the prayers that we make for you every day. Your true and real friends. I’m sorry for the long break, hope you haven´t lost your faith in MJ! !